A Lineweaver-Burk Plot is a graphical display in which the inverse of the rate of an enzyme is plotted against the inverse of the substrate concentration. A great deal of information about the enzyme can be gained using this graphic device. This treatment of the data allows extrapolation of the enzymatic rate at infinite substrate which is equal to the maximum velocity (Vmax.). The intercept at the 1/[S] axis is equal to -1/Km. It also allows distinction between competitive inhibitors (which have identical 1/v intercepts but non identical 1/[S] intercepts as the uninhibited enzyme) and non-competitive inhibitors (which have differend 1/v, but identical 1/[S] intercepts). The following experiment produces the data necessary for the plotting of a Lineweaver-Burk plot. Enter this table into your notebook, then number your tubes, set up in a rack, add the ingredients as specified in the steps below. Fill in A 450 and calculations as you work thru expt. You should also set up an additional set with a putative inhibitor (see bottom of page). Add dH2 O to labeled tubes: the volume required to q.s. to a final vol. = 2.0 mL. Deliver 1.20 mL of Rxn Mix to each tube. Prewarm to 37C for two minutes. At regular intervals (30 sec or 1 min), carefully add appropriate volume of ONPG to start reactions, mix, return to 37C. 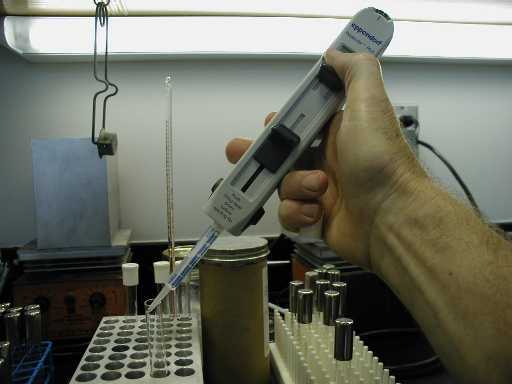 For small volumes of ONPG, take care to follow correct micropipette technique, especially do not dip too far into ONPG reagent, deliver to the side of the reaction tube just at but not touching the surface (avoid the possibility of picking up lactase and taking it back to the ONPG). Wipe pipet tip with wipette to clean between tubes. Vortex the tube to pick up all of the ONPG which may have been deposited on the side of the tube. Read A450 for each tube against the blank tube (contains no ONPG). Graph on a linear scale to produce a Substrate Saturation Curve. Here is an example of a linear/linear graph of activity versus substrate concentration. Fill in the table of the values for the inverses of substrate concentration and of enzyme velocities. Graph to produce Lineweaver-Burk plot. What is the V max? What is the K m? Here is an example of a double recipricol Lineweaver-Burke plot of the same data as above. Inhibition experiment: Add final conc of 25mM glucose (0.5 mL of 1.0 M soln /12 mL Rxn Mx), or 5mM galactose (0.1 mL of 1.0 M soln /12 mL Rxn Mix) to test for possible inhibition of ONPG digestion. What kind of inhibition, if any, is demonstrated? (19.8% = 1 M glucose = 1 M galactose). This technique allows you to produce a homogeneous lawn of bacteria within a thin layer of agar across the surface of a plate. Bacteria are added to a soft top agar (0.75% agar, as opposed to the usual 1.5% for agar plates) which has been melted at 100°C and cooled to 45°C. This is warm enough so the agar remains liquid, but cool enough so that the bacteria are not killed (for a period of time). The melted agar/bacterial suspension is mixed and poured evenly across the top of an agar plate and allowed to solidify. The bacteria distributed through the top agar will grow to produce a homogeneously turbid lawn. If the freshly seeded lawn is exposed to various antibacterial agents and then incubated at 37°C, any inhibition of bacterial growth will cause a reduction in the turbidity of the lawn near the agent: the greater the antibacterial action, the wider the zone of inhibition. Thus, the antibacterial strength of the agent may be judged by the width of the zone of inhibition around it. THE PREVIOUS NIGHT: Inoculate about 2-3 mL of nutrient broth or tryptone soy broth with the desired indicator bacterium (often E. coli B). Grow as a stationary culture ON at 37°C in hot block. THE DAY OF USE: Pipet about 2 mL of hot melted top agar into sterile capped 13×100 mm tubes in a 45°C hot block. Allow to cool to 45°C (several minutes). Pipet about 0.1 mL of an ON culture of indicator bacteria into the melted agar, here using an Eppendorf Repeat Pipetter. Down the inside of the tube is OK.
b. Immediately pour out onto pre-warmed agar plate to empty the tube. When fully gelled, assign and label positions on the plate bottom where agents will be applied or operations performed such as: application of antibacterial agents, antibiotics, exposure to UV, etc. Apply liquids to 5 mm sterile filter discs placed on top of the top agar. Do not let run. Invert, incubate overnight at 37°C. THE NEXT DAY: Next AM, read the plates. Where growth is thickest, there was the least antibacterial action. Where the thinnest, the greatest. Illustrate the plate, measure the zones of inhibition (width of the zone from edge of agent to edge of zone), record data.